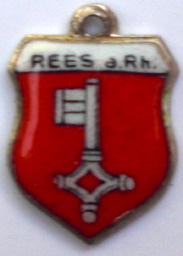 Rees is a town in the district of Cleves in the state of North Rhine-Westphalia, Germany. It is located on the right bank of the Rhine, approx. 20 km east of Cleves. Population (2005): 22,559. Founded in 1228, Rees is the oldest town in the lower Rhine area.